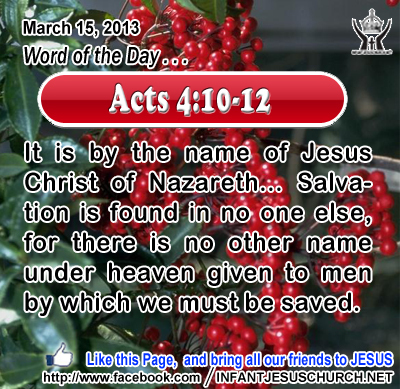 Acts 4:10-12: It is by the name of Jesus Christ of Nazareth... Salvation is found in no one else, for there is no other name under heaven given to men by which we must be saved..
Heavenly Father, through Jesus our savior and redeemer we thank and praise you. Your love has given the sacrifice for our sin and your power has given us the assurance of our resurrection from the dead. Your Son's willingness to spend a lifetime with us has given us a Great High Priest who intercedes with empathy for our struggles. His example lets us know of your great love. Thank you, O God! Thank you for being so gracious and giving us such a wonderful Savior. Amen. No one can be uninterested with Jesus for long. What he said and did - his signs and wonders - he performed in the name of God. Jesus not only declared to be the Messiah, God’s Anointed One. He claimed to be in a unique association with God and to know him as no one else did. To the Jews this was utter blasphemy. The religious authorities did all they could to put a stop to Jesus since they could not accept his claims and the demands he made. We cannot be unconcerned to the claims which Jesus makes on us. We are either for him or beside him. There is no middle ground. We can try to shape Jesus to our own ideas and preferences or we can allow his word to free us from our own lack of knowledge, stubborn pride, and deception. Do we accept all that Jesus has said and done for you with faith and respect or with disbelief and contempt? The consequences are huge, both in this life and in eternity. Heavenly Father, who are the light of the minds that know you, the joy of the hearts that love you, and the power of the wills that serve you; grant us so to know you, that we may truly love you, and so to love you that we may fully serve you, whom to serve is perfect freedom, in Infant Jesus Christ our Lord.